Whether you run a small or large business the ability to accept credit and debit cards is now a requirement and the majority of businesses now have a chip and pin machine to allow these transactions. To keep up with this there is a growing demand for good quality thermal rolls to allow clean, clear and sharp printing of receipts. 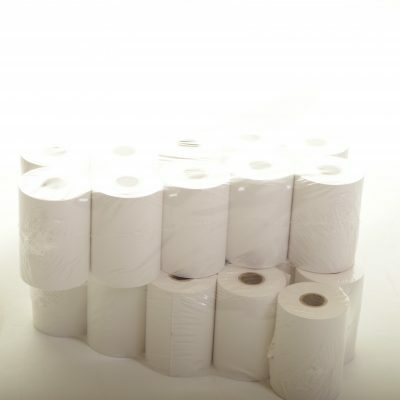 This is where Till Rolls Online can help by offering you top quality chip and pin paper rolls at a low price point. All our chip & pin rolls are made using the best quality thermal paper which not only gives great printed results but helps to cut down on jamming. Thermal chip and pin rolls have replaced impact rolls as the modern standard for chip & pin machines and can be used in a wide range of machines from desktop mounted terminals to portable and wire free machines. With a great range of chip & pin paper rolls available in stock and ready for same day despatch, at Till Rolls Online we’re your one stop shop for all your chip and pin consumable needs. We stock rolls that are compatible with all the leading brands of chip and pin devices but if you need any help or are unsure which roll your machine takes then just give us a call on 0161 327 0108 and we’ll be happy to help.